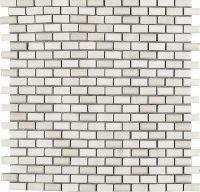 Add a stylish border or feature wall to your kitchen or bathroom with Dekostock Value Mosaic Tiles here at Atlas Ceramics. With a range of striking colours and designs you can match up Dekostock Value Mosaic Tiles with white tiles to enhance the fabulous colours that are available. For quick and easy installation we stock mosaic fixing mesh to help you install your new mosaic tiles perfectly! With stunning glass and metallic mosaic tiles, you can update your décor to create a new stylish look that adds luxury to your home. If you are thinking about redesigning your kitchen or bathroom or just want to spruce it up a bit, then a new tile look is a great option. Any of the tiles from our Dekostock value mosaics range will instantly update the look and feel of your kitchen, bathroom, or wet room. 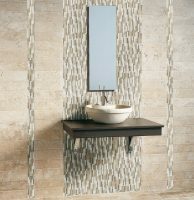 Mosaic tiles are formed by sticking small pieces of material together to create a different look. It’s hard to believe, but mosaics have been fashionable for thousands of years. And there seems to be no danger of them ever going out of fashion either. 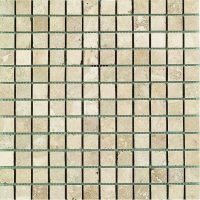 Our Dekostock Value Mosaics are made from a variety of materials including glass, natural stone, or porcelain and ceramic. 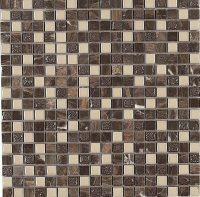 This collection of mosaic tiles are elegant and luxurious, and they will give a luxury feel to any room. In a range of sizes, you can purchase your choice of product in anything from 12x12mm to 300mm in size. 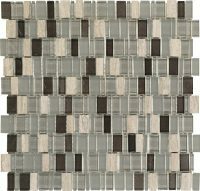 Are These Value Mosaics a Good Choice? Mosaic tiles are a good choice for many rooms in your house, because of the versatility they offer. Probably more than any other type of tile, mosaic tiles can transform a normal surface into a visual masterpiece. You can have a simple, neutral, look if you want to keep it classical. Or you can go for a bold, bright, statement of colour. These Dekostock mosaic tiles are available from beige to purple, and everything in between. 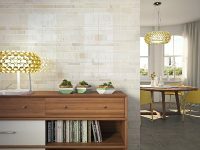 You probably wouldn’t want to use mosaic tiles in every room because of their unique look and feel. This works better in some rooms than others. However, there are many benefits to using mosaic tiles, in spaces where they work well. Durable. Both glass mosaics, and stone mosaics are very durable. This makes them easy to maintain so they will last for many years. Water resistant. Mosaic tiles are often used in bathrooms, kitchens and even in swimming pools due to their water resistant properties. Easy to clean. Mosaic tiles are easy to wipe clean as the material they are made from is non-porous, whether it’s stone or glass. They can be cleaned with a wet cloth which is both easy and more environmentally friendly. Stain resistant. 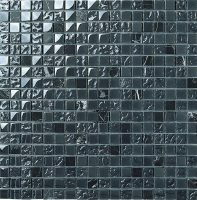 As they are water resistant, and the material is non-porous, mosaic tiles don’t stain. Any kitchen spills can easily be wiped away with a damp cloth. The Dekostock mosaic tiles are also not damaged by chemical cleaning products. Versatile. Dekostock mosaic tiles come in a range of style, size and colour. This versatility allows you to achieve many different looks within your home. You can have mosaic tiles in both your kitchen and bathroom without a similar look and feel. Great designs. Mosaic tiles can be combined with other materials to create a totally unique look. Kitchens and bathrooms both work well with dramatic decor, and this can be achieved to stunning effect through a combination of clever tiling and well-positioned lighting. Probably the first place that comes to mind when you are considering mosaic tiles, is the kitchen splashback. This is because mosaic tiles work particularly well here, and are an easy way to brighten up any kitchen. A kitchen splashback made from glass mosaic tiles is both stylish and functional. If you are just trying to rejuvenate an existing kitchen, adding a mosaic tile splashback is a fairly simple way to do this. It is easy to add and can be cut to fit any size of gap. With mosaic tiles, it is simple to pick out a colour used elsewhere and link to it. So if you had a dark coloured floor, choosing a light and colourful mosaic with a few dark spots of colour will immediately lighten your kitchen. 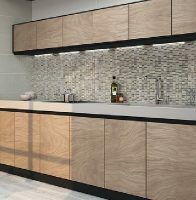 If you are redesigning or redecorating your kitchen, then you can use these Dekostock mosaic tiles to achieve a stylish look throughout the kitchen. You can combine mosaic tiles with larger tiles, like these large format tiles, to achieve a very stylish look. You can mix and match different colours, or different materials together for a look that links different parts of the kitchen in a seamless fashion. Try using different mosaic tiles to create a stylish border which adds a feature that works especially well on a large, blank wall. The Neve Mosaic by Dekostock is a lovely mosaic that looks really nice as a border. Another popular room to have mosaic tiling is a bathroom. Because a bathroom is generally smaller than the kitchen, you can make some adventurous tiling choices. Add in some feature lighting, and you really can create yourself an oasis of calm. Many people go for a blue look in a bathroom. This always looks nice but with so many other colours to choose from, a little variety can make an exciting change. A great look in a bathroom is contrasting colours on different walls. Either have a white wall and team it with a brighter colour or go for another combination. A neutral grey works well with other bright colours for a bold look. If you fancy a modern look, you can even team a colour up with different shades of silver. Wetrooms can be small and dark, so glass mosaics tiles can make the space seem lighter and brighter. Again, combined with clever lighting that reflects off the tiling, you can give a room a totally different look. You don’t have to go for white tiling in a small space, just choose a reflective surface. You will be surprised how airy the space feels. Due to their water resistant properties, mosaic tiles are most commonly used in the bathroom or the kitchen. However, don’t be afraid to venture out into the other areas of your house. Glass tiles, in particular, can be used to provide a splash of colour in other areas, giving your home a very unique look. Picture or mirror frames. You have probably seen many pictures of this in home magazines but never thought of doing it yourself. It works especially well with large mirrors, but equally well with pictures. You will very often see this look paired with a round mirror, but it works with any shape or size. Place small mosaic tiles around the mirror or picture to create a unique frame. Feature wall. You can use mosaic tiles on any wall in your house to make a feature wall. You could create a wide border at the top or bottom of the wall. A band of tiles half way up the wall can look really decorative. Even tiling a large pattern in the middle of a whole wall can work really well as a feature wall. Fireplace. Again this is one of those looks that we often associate with Victorian styles. but a tiled fireplace can look lovely. Glass mosaic tiles are durable enough to use on the fireplace and are very easy to keep clean. This is probably not the place to have greens and reds, but stick to neutral colours for a classy but unobtrusive look. You are trying to enhance the fireplace so using creams and greys won’t overshadow the feature of the fireplace. Outdoors. We associate outdoor tiling more with larger tiles, but mosaic tiling can work really well. Glass mosaic tiling can look great in a porch area and is hardy enough to withstand the cold but is easy to wipe clean. It is not a good idea to use it on the floor though as it can be quite slippery. You can even use it to create a feature piece in the garden, for example, a water feature. Hopefully, you have been motivated by our guidance on using mosaic tiles. 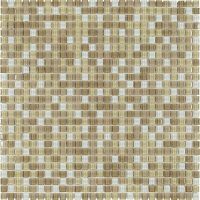 Browse some of the Dekostock value mosaic tiles on our site, for inspiration. We have a range of tiles to suit different rooms in a vast array of colours. Don’t be afraid to ask for our advice, or check out the installation gallery for inspiration and ideas.